Before rain played spoiler in the series deciding one-day international between Pakistan and New Zealand, it was Pakistan in the ascendancy. Barring a Trent Boult inspired defeat in the opening ODI, the home side have generally looked comfortable against New Zealand in the white ball formats. In the T20I leg of the tour, Pakistan extended their unbeaten streak to 11 successive series. However in Test cricket under captain Sarfaraz Ahmed, Pakistan’s record has been more mixed. Last year, the Sarfaraz era began with a disappointing 0-2 whitewash at the hands of Sri Lanka ending a seven year unbeaten run in the UAE, albeit via narrow margins. After overcoming Ireland in their Test debut, Pakistan secured a creditable draw with England in early summer conditions. 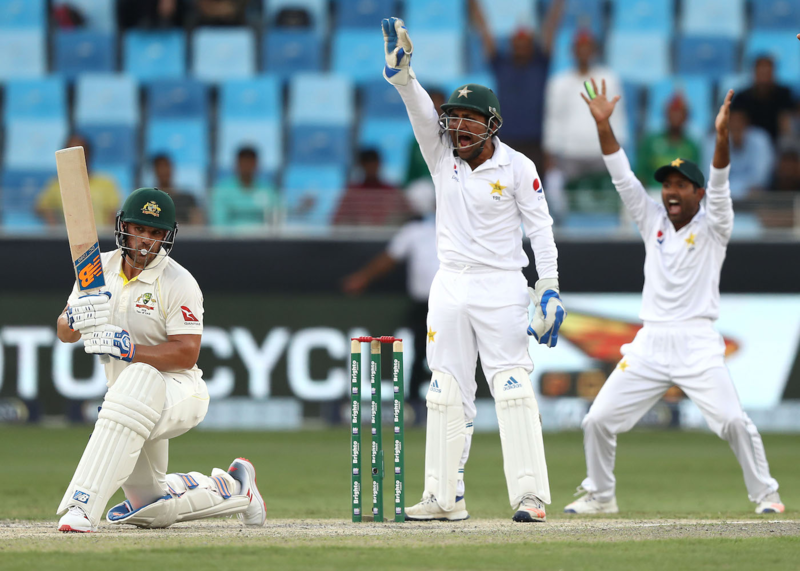 Pakistan then returned to winning ways in the UAE by beating Australia 1-0 with the tourists never challenging them beyond Usman Khawaja’s Test saving heroics on the fifth day in Dubai, and a Nathan Lyon spell on the first morning in Abu Dhabi Test that reduced Pakistan to 57-5. Despite the Australia series win, there remains uncertainty over the playing XI and whether Pakistan approach the New Zealand Tests with one eye on the tough tour of South Africa, or address the here and now by just getting the job done in UAE. One dilemma is what to do with Mohammad Hafeez. Hafeez’s recall was a short-term fix after a poor Asia Cup campaign and paid off in the Dubai Test vs Australia with a well made hundred. He is undoubtedly capable of plundering runs as an opener in Asia on flat tracks with minimal lateral movement. If Hafeez performs against New Zealand, it will be expected that he continues to open in South Africa. However, short-term fixes are just that and against the swinging ball (and a certain Dale Steyn), the “Professor” has been found wanting for the majority of his 15 year career with an average of 11 after 6 Tests in South Africa. Another cause for concern is the form of Azhar Ali. Along with Asad Shafiq, they are the two senior batsmen expected to take charge of an inexperienced batting lineup. However since the retirements of Younis Khan and Misbah-ul-Haq in May 2017, Azhar averages 23 and has not scored a single century. A spell at Somerset in the English County Championship this summer saw him average a modest 33. Perhaps it’s the slowing of reflexes and hand-eye coordination that comes with ageing, or the lack of game time in between Test series for Azhar who is a one format specialist. Or maybe it’s a bad patch. But given Azhar will be turning 34 next February, it would be prudent for the selection committee to begin succession planning – not everyone can resist Father Time as well as Younis and Misbah. With the ball, there are fewer concerns. Mohammad Abbas’s extraordinary start to this Test career has seen him possess a Test bowling average of 15.64 that is better than anyone with 50+ wickets in the last 100 years. He was rightly named the player of the series against Australia after taking 17 wickets at a mere 10.58 – a feat even more impressive given the harsh and oppressive conditions for fast bowling in the Arabian desert. However, many Pakistani players have made an electric start to their careers only to fade away once opposition work on specific plans to nullify them. But given his work ethic, having only a few years ago been working in a leather factory in Sialkot, Abbas should be able to continue new ball duties for the foreseeable future and will be the first name on the team sheet in South Africa against an opposition batting lineup that does not play swing as well as its predecessors. Pakistan need to find him an able new ball partner with the dropping of Mohammad Amir, having failed to live up to the weight of expectations after returning from his spot-fixing ban in 2016, and the loss in form of Hasan Ali – the star of the 2017 Champions Trophy. In the spin department, Yasir Shah will as ever bear the responsibility of winning Test matches on dry, wearing UAE surfaces. However, despite being shorn of David Warner and Steve Smith, Australia were able to neutralise the leg-spinner with Shah averaging 37 in his first Test series after a long absence due to fitness. More worrying is that Shah averaged over 70 against Australia's top six which is his highest bowling average against top six batsmen since his horror tour of Australia in 2016. Shah was never a prodigious turner of the ball nor someone possessing a great deal of variety, instead of relying on wicket-to-wicket accuracy to pick up bowleds and LBWs. Australia’s batsmen avoided the mistake of their 2014 tour by getting out to across-the-line shots - and with New Zealand’s batsmen being better players of spin than Australia – Shah’s form will be under the scanner. Unlike previous seasons, Shah will have the support of another spinner in Bilal Asif who made an excellent start to his Test career with a 6-fer on debut. He is a tall off-spinner who surprised Australia with the bounce he generated and adds variety to an attack lacking a specialist off-spinner since Saeed Ajmal. What is lamentable is as Pakistan approach the 10 year anniversary of the Lahore attack on the Sri Lankan team bus, that conditions in its adopted home of UAE does not always do Pakistan any favours. These sluggish surfaces are inhibiting of the free-flowing stroke-play Pakistan fans yearn to see. Turn is usually slow allowing batsmen time to adjust and pitches do not deteriorate as they do in places like Sri Lanka and India – meaning even a Day 5 pitch in Dubai can still be as good as a Day 2 surface as we saw in the Australia series. It’s to Pakistan’s credit they’ve found a method of success on these wickets in Test cricket but they lack home advantage in the way New Zealand do - who rolled out green-tops in the reverse fixtures in 2016 to roll Pakistan over. Playing a series on these surfaces totally devoid of any pace, seam and bounce has also stunted Pakistan’s game against the short ball and sideways movement – which may prove decisive in their upcoming series against South Africa. Nevertheless, while this series won’t be much preparation for what to expect in Johannesburg, Centurion and Cape Town, another win in the bag is crucial for Sarfaraz's fledgling Test side. With two Tests in Abu Dhabi - a venue where Pakistan have only lost once in 11 Tests, there's a golden opportunity to climb up from 7th in the Test rankings and closer to the summit they were perched on two years ago.